Daily Doodle Vocabulary – Vocabulary Activities for an Entire Year! This Daily Doodle Vocabulary resource will introduce your students to dozens of new vocabulary words, and a brand-new way of learning them: with doodles! Daily Doodle Vocabulary includes 40 weeks of engaging activities! Each week, students will learn four new words. While learning the words, they’ll discover the definition, read a sample sentence, complete a vocabulary task, and then create a DOODLE or sketch based on the word. So much fun! The words are loosely grouped together based on topics or themes. 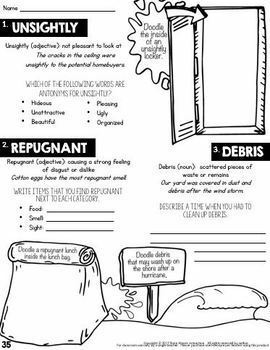 After students learn the four words, they’ll write a paragraph incorporating all of their new vocabulary words. You know what that means, right? Students are not only being exposed to 160 new words, they're also doing the all-important task of putting those words into context, by writing 40, meaningful-to-them paragraphs! Set-up is easy! Just copy the daily vocabulary worksheets for the entire year and bind them together, group them into monthly packets, or distribute them on a weekly basis to students! 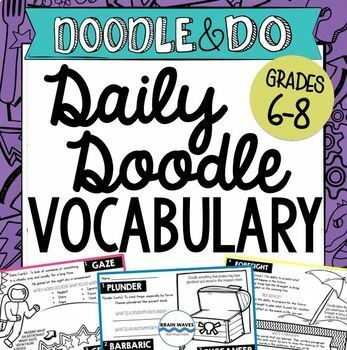 Resources are included to help introduce the Daily Doodle Vocabulary to students. There’s an overview handout that reviews the purpose of the activities along with an explanation about the power of doodling and writing. In addition, you’ll find a “Writing Tips and Tricks” handout to help instruct students about HOW to use their new words correctly in their writing passages. Both handouts are included to help students be more successful all year long! Beyond the 80 pages of Daily Doodle Vocabulary tasks and paragraphs, there’s also a glossary that students can fill in throughout the entire school year! So cool! 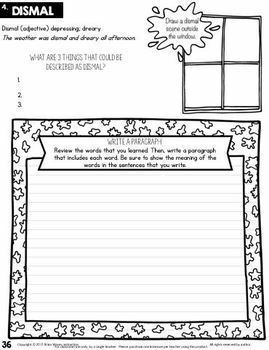 Oh, and since teachers love a little flexibility, there’s even 3 sets of blank doodle vocabulary pages so that you can write in your own custom words for a particular unit of study! You’ll find everything you need to implement an effective and FUN vocabulary program into your classroom! With this resource students will LEARN, PRACTICE, DOODLE and WRITE! Great News! An alternative version of this resource is available for grades 6-8. You might want to combine the two versions so that you can easily differentiate instruction in your classroom. Learn more about the version for grades 3-5 HERE. There’s even more doodle vocabulary for students! 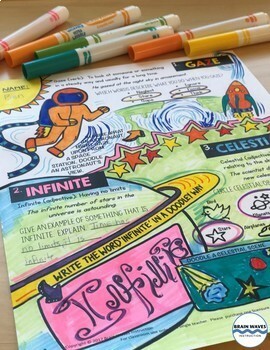 ELEMENTS of FICTION Doodle Vocabulary - Students learn 36 words associated with fiction and doodle along the way! ELEMENTS of NONFICTION Doodle Vocabulary - Students learn 39 words associated with nonfiction and doodle along the way! 120 Daily ELA Warm-Ups! - Students choose to do the “this” or the “that” warm-up each day! 101 Writing Prompts - Students choose which creative prompt they would like to respond to. Get the inside scoop on all store discounts, free products, and product launches. Just click the green “Follow Me” star under my store name on this page or click the green “Follow Me” star on my store homepage. *** Click HERE to receive the Brain Waves Instruction Newsletter filled with exclusive FREEBIES and Teaching Tips!